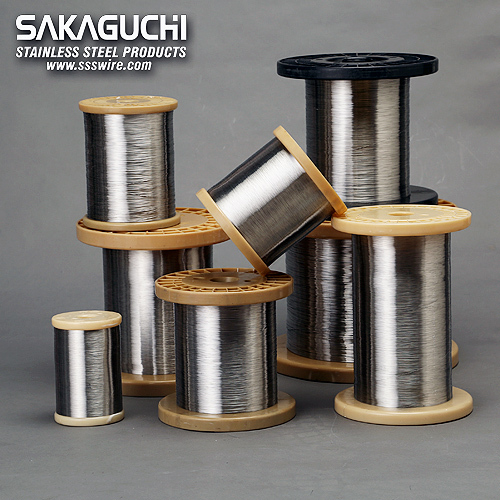 Sakaguchi offers high quality 200, 300, 400 series stainless steel fine wires with diameter range from 0.08 to 2.00mm; soft annealed, 1/4 hard, 1/2 hard, full hard. 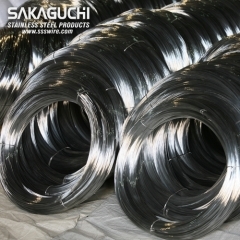 Main grades: 304, 304L, 304H, 316, 316L, 316Ti, 309, 309s, 310, 310s, 321, 314, 430 etc. 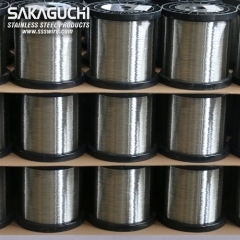 Knitting / Weaving / Braiding Wires - For applications such as knitting and weaving mesh or braiding hoses, the wire diameter required usually range from 0.15 - 0.70mm, with bright surface finish. 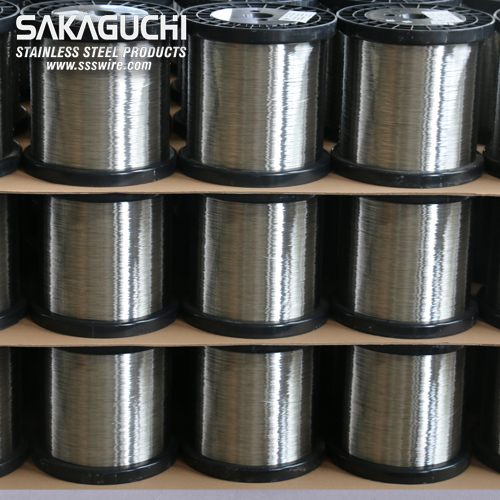 Sakaguchi's weaving wire have excellent corrosion and heat resistance, are oxygen-free solid-solution treated, with bright and smooth surface. Springs Wires - With varies types of surface coating, including bright naked wire, soap film wire, resin wire, colomony film wire. Suitable for high speed automatic spring forming. Rope Wires - With bright and clean surface, ropes and cables made from our stainless steel wires are aesthetically pleasing and widely used in new architecture and ornamnt applications. Brush Wires - High strength stainless steel wire from our unique strait wire manufacturing process can be used to make steel brushings. Wire for EPQ - with bright or matte finish, suitable for electro-polishing operations with end product in the kitchen / bathroom ware and medical fields. Needle Wires - Suitable for the manufacturing of medical, fishing and knitting needles. Straightened Rods - Manufactured with high speed automatic straightening machines that combines the process of drawing, straightening, grinding and cutting. Cut-off Wire - Straightened and cut-off per the customer's specifications, as well as blasting balls used for polishing castings.